Rebel Global Connections combats the cultural isolation seen on college campuses by charging university students from a variety of backgrounds with the task of organizing and implementing intercultural activities. Previously unconnected groups of students will work together as a group, and they will benefit from the task through language exchanges, networking, and service. As a primary service goal, RGC aims to alleviate the problem of cultural isolation for Mississippi schoolchildren by introducing them to a variety of cultures and languages from around the world through age-appropriate programming. National and international college students and Mississippi’s elementary schoolchildren will gain an awareness of each other and the many opportunities the world has to offer through Rebel Global Connections. Rebel Global Connections members paining a mural of the world in Clarksdale. In the Spring of 2013, AmeriCorps VISTA Erin Mauffray pursued the Rebel Global Connections initiative with the help of advisor and Intensive English Program instructor and service-learning coordinator Tracy Koslowski, the Croft Institute for International Studies, the McLean Institute for Public Service and Community Engagement, and many other students, faculty, staff, and fellow VISTAs. The RGC group boasted members from more than 11 different countries and 16 different states. 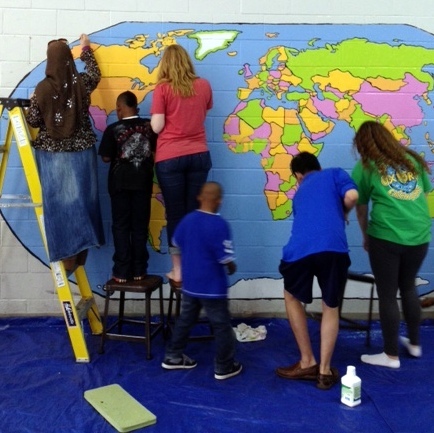 Throughout the semester, Rebel Global Connections students organized a potluck luncheon, hosted two field trips to the University of Mississippi from high-needs elementary schools in the North Panola School District, and traveled to Clarksdale, MS to paint a world map mural at Myrtle Hall IV Elementary School. The Rebel Global Connections student service organization will continue in the Fall of 2013 with the help of incoming VISTA Kathy Trabue and advisor Tracy Koslowski. The group hopes to expand opportunities for schools in north Mississippi, as well as travel with national and international students to different areas of the MS Delta.